A good pair of winter hiking boots adds a lot more to your weekend hunt than just basic comfort. Those which are designed to last will add considerable mobility in accessing difficult terrain, and allow for far more effective stalking in frozen conditions. They need to be durable, waterproof, well insulated and ideally have an industrial standard rubber sole to make scrambling other awkward ground considerably easier. That traction and an effective grip is the key to any good pair of winter hunting boots. So what is on the market for 2019? Well, we’ve picked out ten of the best options for you to examine and are certain that you’ll find a pair here that match your exact criteria. Remember to consider your typical winter hunting environment when selecting a suitable match. Some will be more suited to the easily traversable flat ground than rocky hillsides, and where possible we’ll point this out in our reviews. Let’s start with a truly top quality all-rounder. These malleable rubber boots offer pretty much everything that a seasoned winter hunter may be looking for. Neoprene insulation is going to ensure that you stay fully insulated and dry whatever the conditions. That excellent EVA midsole allows for an easy and comfortable stride made all the better thanks to the natural air circulation that these boots offer. 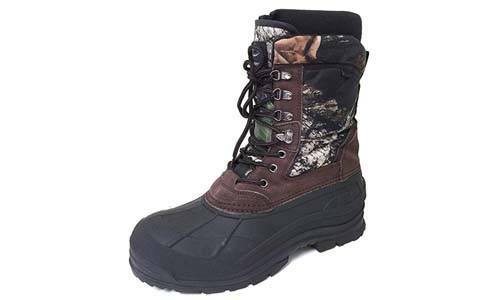 Ideal for those who hunt in the snow thanks to being rated effective at up to-70 deg F, if you want a pair of boots that will stand up to anything then these are a solid choice. 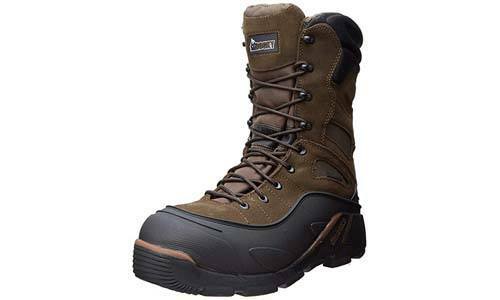 Slightly lighter than the average boot, these will easily double up as a great choice for any outdoors cold weather activity from shoveling snow to hiking. But do not for a second assume that their lightness makes them any less effective! Despite being a combination of leather, textile, and rubber the Rocky waterproof construction is literally guaranteed to keep your feet dry even when wading/forging. The Thinsulate insulation allows for absolute comfort whether on the move or for those hours laid up and waiting for a shot. Quick note – they may feel tight at first but after an hour they will naturally expand to match the shape of your foot. 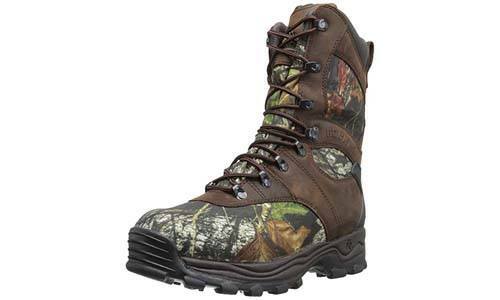 This is a hiking/hunting boot that has been specifically designed for very cold weather indeed. Boasting 1200 grams of Thinsulate insulation is going to be more than a match for even the harshest climate, these are otherwise a classic ‘lace-up’ boot with a sole ideal for traversing both easy and demanding ground. As you may expect, these are a close to waterproof as it gets but what the natural insulation and air circulation you always expect from top quality textile boots. The sole is slightly softer than one may expect,making this perhaps not ideal for extremely rocky/mountainside hunting, but if treading snow these will have your back every time. 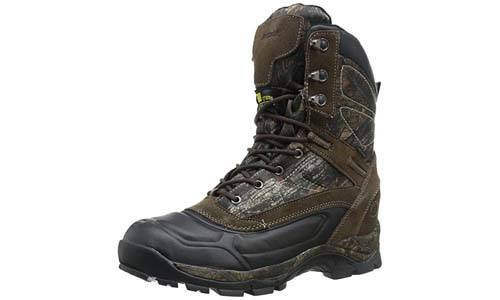 Sometimes you want a winter hunting boot that is as easy to slip on as it gets. Problem is that usually, they tend to compromise on quality! Not so with this pair of boots from MuckBoots – they are a straightforward ‘pull on’ pair which simply has no obvious flaws. Ideal for wading/wet weather conditions thanks to having a 100% waterproof blend of synthetic and fabric materials, they are a stretch fit allowing also for additional comfort and a simple pair with trousers/waterproofs. They may not be the warmest (pair them with a good pair of thermal socks) but for water resistance, these are near impossible to beat. 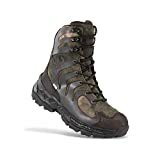 These are a fantastic choice for the more occasional hunter who doesn’t want to spend a lot on boots they may only use a couple of weekends a year. Sturdy in design and a great all-round ‘scramble’ boot, they offer dependable insulation but are primarily designed for grip and comfort. Although they are waterproof, you may wish to add a little spray on sealant just for good measure. In terms of insulation, they are very reliable and will stand up well to general snowy but not necessarily arctic conditions. 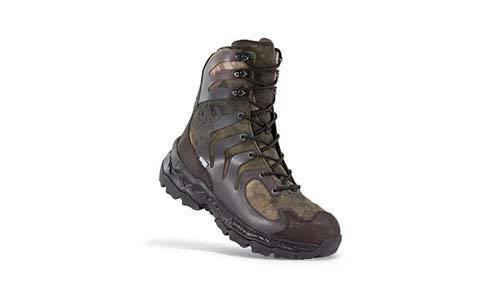 Ideal boots for using in muddy/rocky woodland hunts and an excellent option for casual or newcomers to the great outdoors. 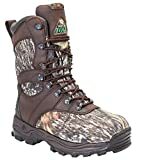 Another option that is ideal for winter hunting on a budget, these are a sturdy and dependable pair of rubber-soled boots that are going to perform far better than the price tag may suggest. 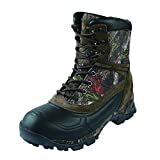 Designed primarily for keeping the feet warm thanks to a Thermolite insulation and removable inner Thinsulate liner, they will be good for handling general hunting activities but may struggle in deeper snow. Perfect for general outdoor winter activities, but seasoned hunters operating in advanced terrain may be looking for something a little more sturdy. 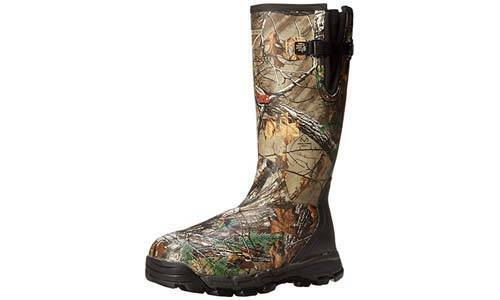 A good introductory boot for temperate climate hunting. If woodland winter hunting is your thing and you need a pair of boots that will stand up to tricky terrain, retain excellent insulation and are simply a delight to stalk in – then maybe these are the perfect boot. These boots are not just ‘all-rounders’ – they’re excellent ‘all-rounders’ for hunting in that style of environment. Boasting a performance fit that actually delivers and with a flawless grip and cushioned ankle support, they are surprisingly lightweight without compromising on a single aspect of quality. A superb choice for those who like the assurance of quality packed into a classic lace-up style. Style and good looks may not be the top priority for many wintertime hunters, but what if you could combine great aesthetics with absolutely fantastic design quality? These classic 100% leather boots also incorporate an inner GORE-TEX lining making them pretty much as waterproof as it can get. Even more important and no doubt a serious factor for seasoned hunters, they also useScentBan technology to prevent bacteria build up from giving away your position to the game. If you need a soft-toe classic hunting boot that packs much more than may appear at first glance, these are a fantastic pair of boots that are very highly recommended indeed. Leading on from the above, this alternative offering from Irish Setter is what may be termed a far more ‘technical’ option. Offering ScentBan technology as well as an ultradry waterproofing system, these rubber-soled boots will help make winter hunting/stalking comfortable and effective. 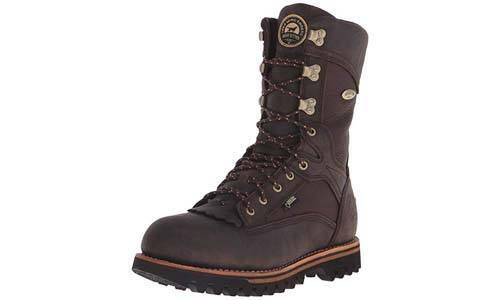 Despite being lightweight this boot is excellent in more rugged terrain thanks to Setter’s proprietaryRPM Technology. This tech allows for high-quality synthetic materials to perform just as well if not even better than leather/canvas – and at around half the weight. 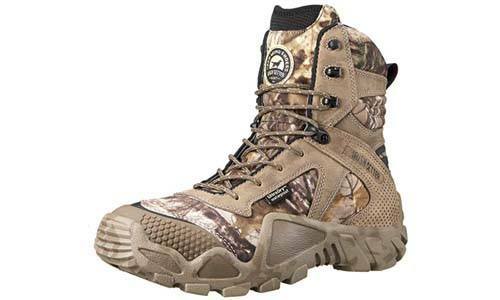 A great choice for hunts that are going to span plenty of miles in difficult/awkward terrain. Of all the boots we’ve featured so far, this is quite possibly the best overall for those who hunt in wet/cold/muddy conditions and need absolute certainty that their boots are going to offer total protection against the elements. Being 100% rubber allows for an easy and malleable fit with the added boost of a qualityneoprene gusset to allow for perfect waterproofing with your pants. The outsole is variable and can easily handle the traction of rugged terrain and be aligned withchamfered edges for being quick on your feet. 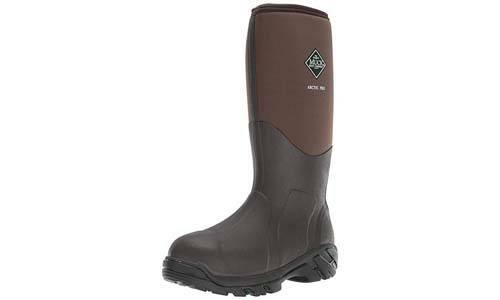 It is a modern, comfortable and very well designed boot that is going to tick all the boxes for many winter hunters. By far and away the most important consideration when choosing a winter hunting boot tends to be heat retention and air circulation. Many people often forget that these two factors work hand in hand, with a boot comprising both being able to keep your feet both warm and comfortable. If only hiking for an hour or two it is unlikely to be of that much importance, but with longer expeditions in very cold temperatures, it is essential. When selecting your boot, look for the level of Thinsulate. 400 gram should be the absolute minimum for winter hunting, with ranges stretching up to 1000 gram for pretty much arctic conditions. If you are going to be wading through water/snow (which you most likely will be in winter) then never compromise on water resistance. A wet foot may as well be an exposed foot, so take particular care when assessing not just the advertised levels of resistance but also previous owner’s experiences. Quite often you’ll be well advised to use additional proofing sprays/wax but ensure these are compliant with the material used on your boot! All winter hunting boots will be to some extent waterproof – but there is a considerable difference in quality. Factor in the durability of the boot because over time wear and tear will affect waterproofing more than any other factor in the boot. For this reason alone never compromise on quality when selecting a boot you hope to last more than a few trips. Which brings us neatly on to discussing materials. Leather may be traditionally the most popular but remember that it can get heavy and may not be the best choice if covering plenty of ground. Canvas and 100% rubber are two alternatives that can be more suitable to certain styles of terrain/hunting – so factor this in when making your decision. Canvas is lighter but generally less durable, rubber is not necessarily as comfortable (matter of personal choice). The most important factor is the quality and style of the soles. These must be rubber – accept no alternatives as they provide perfect grip, reduce noise and allow for excellent traction in poor conditions. Many rough and tough winter hunters seem to assume that comfort is a low priority factor when in truth it is one of the most important. A poorly suited/fitting pair of boots will cause blisters and friction burns while also slowing you and your party down. It really is a matter of personal choice as some people prefer classic lace-ups, others slip on and so forth. Just because one style has always suited you doesn’t mean it is necessarily the best. So there we have our guide to the best winter hunting boots in 2019. As you can see there is a huge market to choose between and whittling it down to find the perfect boot can be a more complicated process than many may assume. But by far and away the most important place to begin is by assessing the ground you expect to be hunting across and the needs that will be demanded from your footwear. It is always worthwhile looking for a pair of boots that will – with good care – last many hunting trips. There are few things more frustrating that having to break in a new boot every couple of years, and it can also be unnecessarily expensive in the long run. So save up a little during the summer months and invest that little higher up the market than you may otherwise be expecting to. It can and most likely will make all the difference.